Home » MXIII-G Smart TV Box – First impressions, firmware details and tests. MXIII-G Smart TV Box – First impressions, firmware details and tests. As I told you in this article, Gearbest online store send me a few days ago a new Amlogic S812 Android TV Boxes: MXIII-G. Here you’ll find a photo gallery and a video with the unboxing of this nice device. As I told you in this article, Gearbest online store send me a few days ago a new Amlogic S812 Android TV Boxes: MXIII-G. Here you’ll find a photo gallery and a video with the unboxing of this nice device. The TV box has a black matte plastic exterior with power button on top, it is strong and very well organized, with and all the connectors located in the rear & right sides. In the front side it has only the IR receiver. The overall impression is pretty nice, the device looks to be constructed with care to details. ● it comes with a RJ45 jack for 1000M Ethernet which provides a strong network extension. Next, watch the first impressions and the experience on Android KitKat 4.4.2. 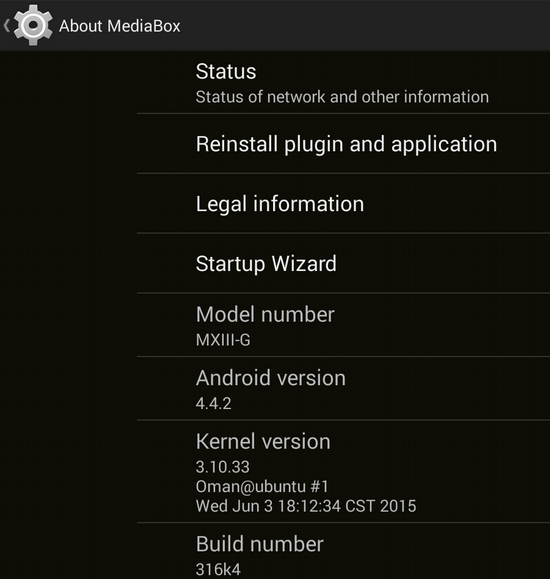 Yesterday I managed to update the stock firmware to Andoid Lollipop 5.1, you can see the tutorial in this article.